I see a lot of users asking questions on here like this one, where users ask something that more or less like this. I don't mean to call this user or post out in particular, this is just one of many examples and I happened to remember the tag so it was easy to find. When will this be incorporated in the design of modern cars? Considering this concept has been around so long, when will it be incorporated in the design of modern cars? Now, this question is off-topic and has such been put on-hold for being a question about technology and not patents, but I'm disregarding that for the purposes of this discussion. My point is more that, as the keen observer will note, it refers to "this" without ever telling us what it's talking about (cue antecedent basis joke?). It never mentions a patent, application, or even technology that's in any way researchable. As I said, this isn't an uncommon phenomenon here on Ask Patents. I've seen a number of questions just like this, and that got me curious: What does Ask Patents do to advertise the site? Specifically, do we show ads on a page that has details about specific patents? Perhaps those users read about a patent, see a bar on the side that says "have a question about patents? Ask it here!" and assume that it will have an inherent association? 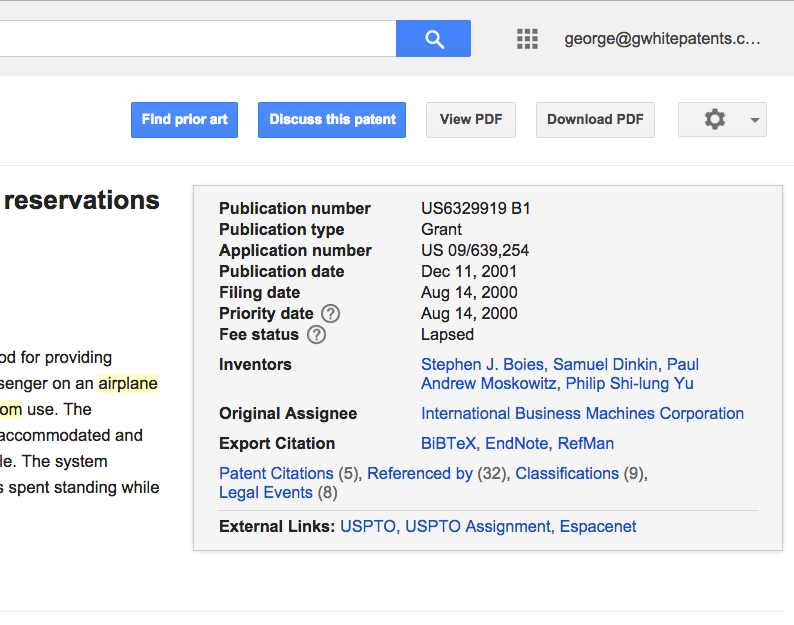 YES - Every google patents page has a large "Discuss this patent" button at the top of the page right next to the "Find Prior Art" button. If you click it and there is already a tagged post for that document then - bang you are here. If not there is a landing page that identifies Ask Patents and then you here. I just did that for the IBM "can I go the bathroom" patent and posted a question. I asked about this in Meta many months ago. It is great to have such a prominent connection to google patents but it explains the very off topic questions and why people assume they are talking to someone connected to the patent is question. It is a source of a high % of questions, almost all of them horribly off topic and unaware of SE style. Surprisingly, the patent number did get into the tag. That mechanism must break in many cases because we don't see them. Not the answer you're looking for? Browse other questions tagged discussion site-promotion new-users .